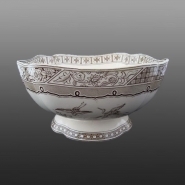 A side view of the bowl displays a large border with floral scrolls and geometric shapes. Printed on each side of the bowl are Kingfishers in flight. A square molded, indented earthenware bowl with pedestal printed in brown in a pattern the maker named Melbourne which is included in the mark. The registry mark indicates a date of August 27, 1881. Featured on the interior of the bowl is the English Kingfisher and below it is a cartouche with a water-scape that includes a rising sun, boats, and houses on the shore. The sides of the dish contain images of the bird in flight.